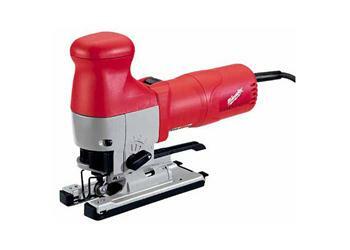 At 6.2 amps, Milwaukee's 6276-21 Orbital Jig Saw is the highest powered Jig Saw in the industry! The Jig Saw has a 1 inch blade stroke with a 4-position orbital cutting action and 7 setting speed dial with 500 to 3,000 strokes per minute for fast cutting when you need it. A sturdy 6.25-inch cast aluminum base provides greater stability and the base plate has the tightest distance to nose of saw for cutting in tight corners. A keyless 45° bevel shoe adjusts quickly for angle cuts. The low position roller guide ensures blade stability and a precision cut. The Quik-Lok blade change system allows quick blade changes without the use of any tools. The built-in dust collection port allows attachment to a vacuum. Uses T-shank jig saw blades.